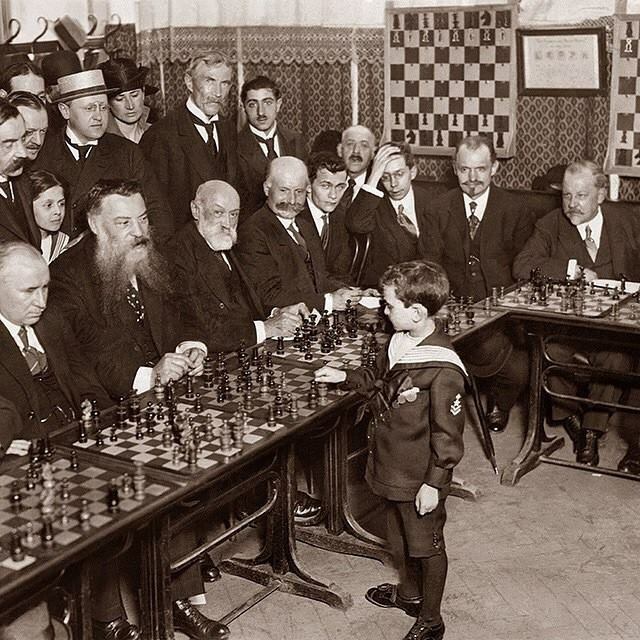 “Twenty graybeards sitting in a square played chess yesterday in Paris against a very small boy 8 years old, and he beat them all,” began a @nytimes article written 95 years ago this week. The boy, Samuel Rzeschewski, “moved quietly from one board to another, reducing their most skillful plans and wiles to nothingness.” Young Samuel — whose head was reported to be “well shaped, but not abnormal” — had been playing since the age of 5. The article reported that the Polish-born prodigy would soon retire from days spent dazzling the capitals and courts of Europe. But he kept playing, and in November 1920, sailed to New York to become the top name in American #chess. As an adult, his last name changed to Reshevsky, he won the United States Chess Championship seven times. But despite international victories, he never took the title of world champion. Photo from the @nytimes archives. ← These words, this woman….. Wow! !